우리는 누군가에 대한 ‘관심’과 ‘경계심’을 동시에 지니며 살아간다. 사람들은 마음이 불편할 때, 속마음을 솔직하게 드러내기보다 오히려 여러 유형의 막으로 스스로를 감싸 안는다. 반면 눈에 보이는 겉모습은 치장한다. 이는 사회적 학습에 의한 행동이자 자기보호본능이기도 하다. 그로 인해 타인의 시선을 의식한 물리적인 막(screen)이 겹겹이 등장하게 되며, 심리적인 거리감은 더욱 커지게 된다. 이러한 점과 관련하여, 작가는 우리 주변에 어떠한 유형의 ‘거리두기’ 장면들이 펼쳐져 있는지 지속적으로 관찰해오고 있다. 이전 《White Silence》(2018) 전시를 통해 발표된 "The Wall in the Mind"(2016~2017) 회화 시리즈 작업은 타인과의 관계 속에 존재하는 심리적 경계를 어떠한 사물을 떠올릴 수 있는 가시적인 하얀 덩어리들에 빗대어 표현하였다. 이번 《Curve》 전시에서 발표되는 드로잉, 회화, 설치 작품은 구체적인 형상을 드러내기보다 추상적 요소들이 부각된다. 기존의 물리적인 경계에 대한 초점이 ‘비가시적인’ 심리로 이동했음을 보여준다. 이는 2016년 노르웨이 레지던시를 참여하면서 경험하게 된 ‘막’에 대한 인식의 변화를 반영한다. 사람의 심리는 눈으로 볼 수 없는 영역이며, 기표와 기의처럼 언어로 정확히 규정할 수 없어 객관적으로 형상화하기 어렵다. 심리는 오직 개인 스스로의 감정을 통해 알 수 있다. 그 감정은 자신의 ‘직관’과 ‘상상’을 결합시켜 마음속의 형상을 구체화시키는 과정을 거쳐 외부로 드러나게 된다. 이러한 무형의 감정을 형상으로 표현하기 위해, 작가는 기억을 되짚어 특정 공간에서 경험했던 자신의 심리적 감정에 대해 집중하고, 이에 대한 상상화를 그려나간다. 노르웨이에서 제작된 "N-Drawing"(2016) 시리즈는 작가의 지속적인 관심의 대상이었던 ‘막_경계’를 허물어뜨린 경험적 드로잉이다. 작가에게 드로잉은 회화에 등장하는 ‘그리기’와 같은 개념이다. 회화 작품은 이 드로잉들을 바탕으로 상상이 더욱 부각되어 심리적인 풍경화로 구성된다. 추상적 형태, 부드러운 느낌의 촉각적 표현, 반복적인 붓의 터치, 겹쳐지며 발색되는 색의 표현방식 등 작가는 자신의 웅얼거림이 어떻게 시각화되는지 고민하며 작품에서 여러 방식을 시도한다. 이제, 작가는 더 이상 막을 바라보지 않는다. 무엇인지 인식할 수 없는 확장된 어느 곳으로, 시선을 옮겼다. 작품화면에는 부드러운 색상으로 표현된 잔잔한 바람에 나부끼는 풀과 같은 털이 등장한다. 곡선의 추상적 표현이 드러나고, 부유하는 듯한 상황과 수평적 시선을 담은 상상적 풍경이 펼쳐진다. 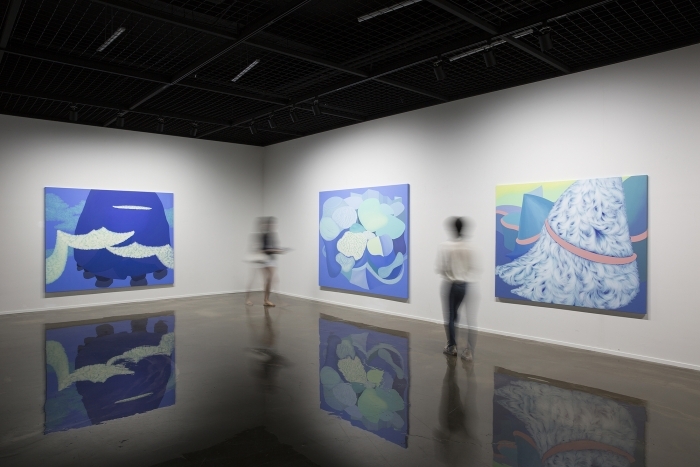 낚싯줄을 이용한 "Blue drawing"(2018) 설치 작품은 작가가 지속적으로 다루고 있는 ‘반투명성’에 대한 관심의 연장선상에 있다. 전시장에서 드로잉과 회화 작품 사이에 설치된 이 작품은 모호하게 가려진 듯 혹은 열린 듯한 상황에 놓여 있으며, 관람객은 실제로 이 작품 사이를 열고 지나갈 수 있다. We feel both interested in and wary of others. When people feel uncomfortable, they cover themselves up with different types of layers, rather than honestly expressing how they really feel inside. On the other hand, they also decorate their appearance. This is a behavior taught through social learning as well as the instinct of self-preservation. Layers of physical screens are built up from feeling conscious of the eyes of others, and this increases our psychological distance. Regarding this idea, I have been observing the various types of actions taken to create distance. The painting series "The Wall in the Mind"(2016-2017) introduced at the exhibition, 《White Silence》(2018), described the psychological boundaries that one feels from relationships with others using white clods that remind us of certain objects. Drawings, paintings, and installations presented at 《Curve》 show that my focus on physical boundaries has moved to ‘invisible’ psychology. This reflects the change in my understanding of ‘screens’ after my participation in the Norway Residency in 2016. Our psychology cannot be seen, and it is difficult to make it tangible objectively since it cannot be stipulated in words or signified. Psychology can only be known through personal emotions. These emotions are expressed after going through the process of shaping the form of feelings by combining intuition with imagination. To frame such intangible emotions into forms, I used my memories to concentrate on the psychological feelings that I experienced in specific spaces, and then started drawing an imaginary picture. The "N-Drawing"(2016) series created in Norway are drawings based on the experience of tearing down the ‘screen boundary’, which is a subject of ongoing interest. To me, drawing is sketching for painting. The imagination added to this drawing is given more prominence and it creates a psychological landscape. The abstract form, the tactile expression of a soft feeling, the repetitive touches of the brush, and the colors layered in paint. I think about how to visualize my mumblings, and I try out these different methods. I no longer focus on the screen – the focus has been shifted to something broader that cannot be recognized. The artwork shows soft-colored, grass-like fur fluttering in the mild wind. The abstract expression of curves, the horizontal perspective, and the object that looks as if it is floating – together they create an imaginary landscape. The installation "Blue Drawing"(2018) uses a fishing line as an extension of my interest in the idea of translucence that I have been continuously working on. Installing this piece between my drawings and paintings at the exhibition is both slightly blocked and slightly open. The audience can open up and walk through this piece.